You have performed some lengthy research, set-up a campaign, and are now receiving clicks to the website you are promoting. The next step of this process is to implement some sort of testing and/or analytics that will help you evaluate your campaigns performance and refine your campaign to achieve maximum profitability. As Internet marketers, we should try to clean or rinse our campaigns of components (keywords, web pages) that are under performing and just costing us money. It has been said that 20% of an advertisers keywords bring in most of the sales, while the other 80% of the keywords are under performing. If this is not 100% accurate, it is very close to the truth. There are several different aspects to a successful campaign, and there are many things that you can “refine” to increase your campaigns overall performance and profitability. Are your keywords performing? What about your ads, are they achieving a high enough CTR? Is your web page converting, if not, is it because your merchant conversions are low? Is your squeeze page working? Is your sales copy effective? There is no scientific approach to refining your campaign. However, there are some things that you can do to obtain campaign analytics which will guide you when deciding which changes you should make. How Effective is Your Webpage? In this test we are going to use My-Linker in combination with your Google Adwords account to determine how effective your webpage is at getting visitors to click-through your affiliate links. My-Linker (www.my-linker.com) is a program that is exclusive to Wealthy Affiliate members and allows you to analyze your merchant page conversions. My Linker counts merchant page conversions when your website visitors click on your affiliate links. You can set up specific campaigns within My-Linker which enable you to create specific links for your site and track how effective your web page is at persuading your visitors to visit the merchant sales page. The higher the merchant page click-through, the better job your page is doing obtaining the visitors interest enough to send them to affiliate sites. You will be able to log into my-linker using your Wealthy Affiliate login username and password. Instructions on how to properly use My-Linker can be found upon logging into the application. By adding My-Linker links to your web pages you will be able to determine exactly which keywords are generating merchant page click-throughs. This is a very important aspect to a successful campaign, because if your keywords are under performing, they either need to be deleted, or you will need to make your web pages more relevant to these keywords to improve the click-throughs. Which Keywords are Earning You Money? Many programs online allow you to append your Google conversion tracking code to their URL so that you can track sales. 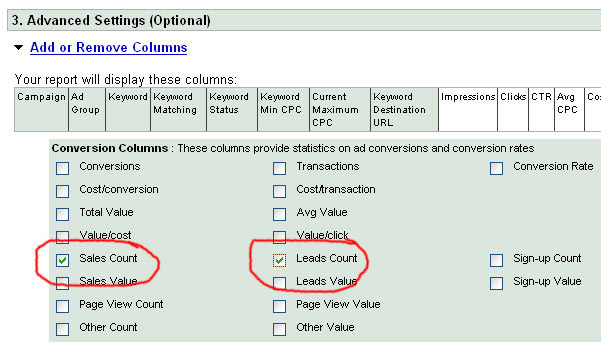 An example of this is Beating Adwords affiliate program (http://www.beatingadwords.com/affiliates.php). The conversion code is dynamically passed to the order page, so that when someone purchases the product a conversion is tabulated within your Google account under the exact keyword that generated the conversion. You can also email merchants and ask them to put your conversion code on their order confirmation page. Typically the merchant will only do this for their high volume affiliates, but it is definitely worth a shot regardless of how much traffic you send to a merchant page. Google Sales conversion tracking allows you to track your sales right down to the keyword level. If you have conversion tracking in place for sales conversions, you will find that 10-20% of your keywords bring in most of your sales. You can quickly weed out under performing keywords or make the appropriate changes to your webpages to make it more relevant and convert better. Note: If you are using My-Linker to track your merchant page click through rates, you will not be able to determine the difference between sales and leads on the campaign summary page. To determine exactly which keywords are generating sales, leads, or both, you need to create a report in the “Reporting” section of your Adwords account. Under the “Advanced Settings” choose to add Sales Count and Leads Count. This will split up the conversion data and show you exactly which conversions were sales, and which were leads. As you can see above, creating a custom report will help you determine which "Conversions" came from leads through My-Linker, and which were actual sales. 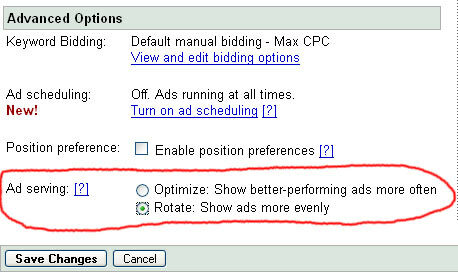 Split testing ads is very easy to do within your Google Adwords account. What you want to do is create TWO ads within an ad group that have different ad text, but has the same destination and display URL’s. When split testing ad groups, you will want to make sure that your Campaign settings have Ad Optimization turned off. This will allow each of your ads to run 50% of the time, because if this setting is on, Google will serve your highest performing ad most of the time. For testing purposes, we want a true 50/50 split test to take place so we can determine which ad is performing better. Once you can determine that an ad is performing better (getting a better CTR) you’ll want to scrap the “loser” and replace it with a new ad. At this point a new split test will occur. We suggest that you continually split test ads until you achieve maximum CTR for the keywords within the ad group. Note: You should use different ad writing techniques for each ad. A couple things you may want to test are the use of the exact keywords (from the ad group) within the ad, using a questions, a call-to-action, and the use of the "scam" word. Testing 2 Different Landing Pages - Which one Converts Better? There are two reasons you would want to split test landing pages: to test sales conversions and to test merchant page click-throughs. Both of these tests will give you an idea on how effective your landing pages are performing and will indicate which landing page styles are the highest performing ones. To test conversions you will need to set-up TWO different Clickbank tracking ID's. You will create one landing page using the one Clickbank tracking ID , and one landing page using the other Clickbank tracking ID. You will then want to create and ad group and two ads with the exact same ad text, but different destination URL’s. You will also want to have your ads served equally (“Rotate”) so that each page receives an equal amount of traffic. You can change the "tid" to whatever you like, and this string will show up within your Clickbank transactions if you make a sale through this link. By having two Clickbank tracking ID's, you will be able to determine which page is converting into sales at a higher rate. Without having access to conversion tracking through a merchant, this is the most effective way to determine which landing page is converting better for you. Based on your results, you can perform several different tests and make different modifications to your landing pages to increase your overall conversions. By focusing on landing page conversions, you will be able to increase your overall campaign profitability. There are many different search engines and search networks available to us as advertisers. Let's be clear on something. Traffic from one source is not the same as another. Even traffic from Google and Yahoo is totally and utterly different. Google may convert sales better for one industry, while yahoo will convert better for another. The same goes for generating opt-ins and this split test will help you determine which traffic sources are the best to use. To implement this test, you will want to create multiple web pages, and include your opt-in forms on these pages. You will want to make sure that you label your forms differently so that you can tell which leads are coming form which opt-in form (and consequently, which page). You can actually label different forms through Aweber, and then query to see the results. On each of the above pages, you will have an opt-in form that adds users to a single mailing list, but each form will have it's own unique ID. This will allow you to determine how many subscriptions to your list were generated from each traffic source. The lower your CPL is, the more effective the traffic source is for generating a lead. You may find out that within your particular industry that alternate search engines will be more cost-effective than Google or Yahoo, but this is something that you need to TEST. Yahoo and Google typically yield the highest volumes of quality traffic so these will likely be the starting traffic sources that you use for your test. These are some great techniques that you should consider implementing when trying to refine your campaigns and optimize your campaigns for cost efficiency. By performing just a few of these tests, you will be able to determine which landing pages work and why, how well you pages are converting into merchant click-throughs, and through trial and error you will be able to create much more efficient campaigns. We suggest that you adopt testing into your day-to-day activities. You will not only benefit from it in the short-term, but you will be continually maximizing your profitability and save yourself thousands of dollars in the long term. We have wasted tens of thousands of dollars over the years on keywords and landing pages that simply do not produce, and if you can limit these through testing you can keep this money in your pocket.